Ocean - Universe Galaxies And Stars Section. Ocean Patterns Dictate Dry and Wet Periods. Ocean Patterns: Image credit: http://www.jpl.nasa.gov/images/earth/pacific/pacific-012304-browse.jpg. New data gathered by NASA's Topex/Poseidon and Jason satellites seems to indicate that the cooler and drier periods in Southern California are a direct result of a long-term ocean pattern called the Pacific Decadal Oscillation. By measuring the ocean and atmosphere over the Pacific Ocean, forecasters can predict the temperatures and rainfall estimates for up to a year in advance. The full cycle of this effect can last 50 years, and right now the trend is towards a drier climate for the next five years. The cooler and drier conditions in Southern California over the last few years appear to be a direct result of a long-term ocean pattern known as the Pacific Decadal Oscillation, according to research presented recently at the 2004 meeting of the American Meteorological Society. The study by Steve LaDochy, associate professor of geography at California State University, Los Angeles; Dr. Bill Patzert, research oceanographer at NASA's Jet Propulsion Laboratory in Pasadena, Calif.; and others, suggests Pacific oceanic and atmospheric measurements can be used to forecast seasonal West Coast temperatures and precipitation up to a year in advance, from Seattle to San Diego. 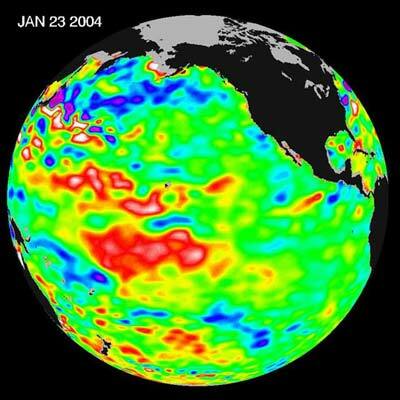 An important climate controller, the Pacific Decadal Oscillation is a basin-wide oceanic pattern similar to El Niño and La Niña but much larger. The pattern lasts many decades rather than just a few months like El Niño and La Niña. The climatic fingerprints of the pattern are most visible in the North Pacific and North America, with secondary influences coming from the tropics. The long-term nature of the pattern makes it useful for forecasting, as its effects persist for so long. Since mid-1992, NASA has been able to provide space-based, synoptic views of the entire Pacific Ocean and its shifts in heat content through the Topex/Poseidon mission and its follow-up mission, Jason (which began in 2001). Before these satellites were available, monitoring oceanic climate signals in near-real time was virtually impossible. The remarkable data and images can tag and monitor the shifts in short-term climate events, like El Niño and La Niña, and long-term events such as the Pacific Decadal Oscillation. These data provide a 13-year continuous, complete time-series of two major El Niños and two La Niñas, and have made it possible to detect a major phase shift of the Pacific Decadal Oscillation. Patzert and LaDochy show that these data, when combined with longer-term studies of land-based data, provide a powerful set of forecasting tools. The pattern shifted to a negative, cool phase, leading to wetter conditions in the U.S. Pacific Northwest, and drier than normal conditions in Central and Southern California this decade. Since the last El Nino in 1997-1998, the Los Angeles area has had only 79 percent of its normal rainfall, Patzert said. Lake Mead, the great fresh-water reservoir in southeast Nevada, is at less than 50 percent of normal capacity. Also, huge West Coast fires over the past few years have been greatly exacerbated by drought induced by the pattern, Patzert added. "These shifts in the pattern are long-term tendencies, which actually have a bigger economic impact than El Niño," said Patzert. "People talk about floods from El Niño, but what really has a harsh and costly impact is a five-year drought." "A full cycle of the Pacific Decadal Oscillation (cool to warm and back to cool) runs about 50 years," said LaDochy. "Over the next several years there is going to be a tendency toward dry and colder temperatures in the southern U.S. West Coast. It is very difficult to forecast day-to-day here on the West Coast, but we can say with some confidence that over the next five years, we'd better start saving water." The researchers used more than 50 years of U.S. climatic information, and Pacific atmospheric and oceanic data from the National Oceanic and Atmospheric Administration’s National Centers for Environmental Prediction. By comparing data, they saw strong correlations between Pacific climate patterns, temperatures and precipitation trends on the West Coast. They then were able to develop "hindcasts" to explain temperature and precipitation variability for West Coast regions. These decadal cycles also will be useful for explaining future regional climate variability.